Two of the attributes that are related to the Exalted Being. 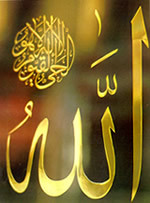 AsAllah’s Exalted Self can not be compared to those of His creatures’,therefore, His Attributes can not be compared to those of His creatures’.Some scholars said that the attribute and the described are one and thesame, and others claimed that the two are different; a third group saidthat the attribute is not the described but at the same time they are notdifferent. All what has been said is not permissible, for man should notlet his mind think of what is unpardonable to think of, because Allah’sAttributes are beyond the perception of our minds; besides, we can not understandthe true essence of Allah’s attributes. Our ancestors, may Allah be pleased with them , perceived these Divine Attributes in accordance with theirliteral meanings, that is to say, from a linguistic point of view. They didnot delve beyond the literal meaning of these Divine Attributes, and theydid not wade through comparisons and definitions that are derived from thefact that these epithets are also attributed to the created beings. As theExalted Being can not be compared to any other being, so are His Attributes, they can not be compared to the attributes of any other being. We should attribute to Him only what He attributed to Himself without interpretation or analogy and assign the knowledge of the true essence of His Attributes to Him. We should say that Allah is All-Knowing having knowledge, Living having a life, All-Powerful having an overwhelming power, Willing having volition, Speaking, ALL-SEEING, and ALL-HEARING having means to speak,to see, and to hear, without letting the mind think about how this couldtake place. The ALL-HEARING is Allah Whose Knowledge encompasses everything. Nothing can escape His Knowledge even if it were covert, hidden or faint; nothing skips His ALL-HEARING Power; no call can ever occupy or hinder Him from hearing and answering another call. His ALL-HEARING Power encompasses all the misgivings of the souls; this power is perfect in receiving all sounds and voices. Languages are His Creation, so no language can ever be intricate for Him; He is too Exalted for having His ALL-HEARING Power linked to an organ, but it is an epithet through which anything that is heard is revealed to Him. Allah is the ALL-SEEING, nothing can escape His ALL-SEEING Power even what is under the grains of sand; Allah sees the secrets of thoughts; no darkness or veils can conceal anything from His DivineVision that is too Exalted for being linked to an organ. Allah’sALL-SEEING Power is a Divine Epithet through which all what is seen is revealedto Him. No glimpse of ideas can escape Him; no existent being can be eclipsed from His ALL-SEEING Power whether it is manifest or covert. Allah says to Moses, “..for I am with you : I hearand see everything” (TA-HA, 46) , and Hesays, “God has indeed heard and accepted the statement of the womanwho pleads with thee concerning her husband.”(MUJADILA, 1), “God hath heard the taunt of those who say: Truly, Godis indigent and we are rich” (AL-I-‘IMRAN, 181), “..or they think that We hear not their secrets and their privatecounsels? Indeed We do, and Our Messengers are by them, to record.”(ZUKHRUF, 80), “By no means! Proceed then, bothof you, with Our signs; We are with you, and will listen to your call.” (SHU‘ARAA’, 15) , “For God is He Who hears and sees all things.” (HAJJ, 75). Glory be to the ALL-SEEING, the ALL-HEARING, Praise and Glory be to Him, He is Allah.